The Alcove Gallery is a pocket gallery tucked into the spacious entrance to Antioch University Midwest. With an easy hanging system it’s a perfect space for a small show. 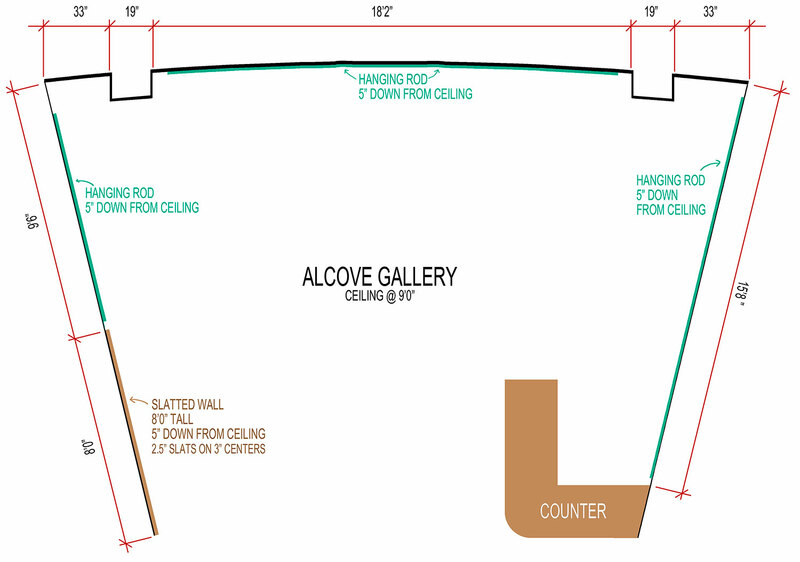 The Alcove Gallery Program, managed by Yellow Springs Arts Council (YSAC), in partnership with Antioch University Midwest (AUM), provides gallery space and consultation services to artists. 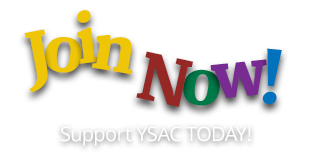 The program stimulates membership for the YSAC and supports artists of multiple disciplines and experience levels in Yellow Springs and beyond. While artists are encouraged to exhibit for professional gain – including visibility, networking, and sales – our presenting artists are fundamentally motivated by a desire to enhance the community’s creative spirit through their art. The Alcove Gallery is available for exhibition by current YSAC members. Individuals may become members with the express purpose of presenting in the gallery. Solo and shared exhibits, as well as collaboration with other arts disciplines for receptions, are encouraged. All work must be original. The Alcove Gallery hosts six shows per year, and started in March of 2017. July-August, September-October, and November-December are currently open. To apply for a show at the Alcove Gallery, please download an application here and mail to P.O. Box 459, Yellow Springs, Ohio 45387, or email to Angela Smith, Alcove Gallery Coordinator. Antioch University Midwest (AUM) is located at 900 Dayton St., Yellow Springs. 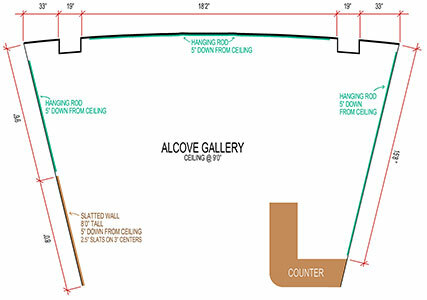 General operating hours are Monday-Friday, 8:30-5 p.m.
A map of the Alcove Gallery, click on image to see larger view. David’s personal rendition of the study of light and movement to sound.